Now for some music from an independent European record label that has Sondre Lerche on its roster. The stuff on here is great... mostly mellow. You could waste your whole life playing with widgets. Here's a very interesting Ad Age article about the unconventional advertising in the presidential primaries and how it has led to Barack Obama's dominance over Hilary Clinton in the online world. Yet he's not asking for any of it. Whatever the result is... this stuff is way more powerful than slandering opponents, ads about tax cuts, or ads featuring "Hail to the Chief." What will the effects of individually created advertising in the form of online viral videos, websites and posters be? Right now they seem like a very positive force behind Obama, creating buzz, generating user interaction, and establishing the "Obama" brand. But do they also have the potential to harm? What if one of these artists is associated with something that would reflect negatively on the potential presidential candidate? There's a risk in everything. Always the possibility of alienating somebody. Even if Obama's not asking for these ads, he's getting them. Allowing others to act as a mouthpiece for you or to create publicity in your name could be dangerous. Then again, so is choosing Kobe Bryant or Michael Vick as your spokesperson. You can find these signs for McDonalds all over Europe. Sometimes they tell you, "Keep your course going straight ahead, you're on the right track." Other times they'll let you know, "Head left, right or straight and you'll run into us," which means there are 3 separate McDonalds locations within a few hundred meters of each other. Or many times they'll say, "Oh on, turn around immediately! You just missed us 200 meters back." 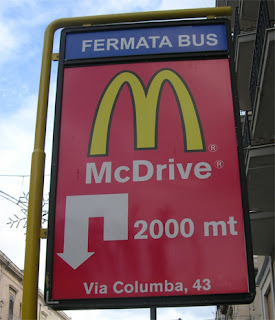 But this one for the McDrive has the nerve to tell you, "Oops, turn around you just missed us 2,000 meters back." Hmmm... let's just go 2 km, or over a mile, back the other way. How bad do you want that Big Mac? It's EVERYWHERE!!! I've seen it rear its ugly head even in Italy. And now today, in my sweet, innocent little town of Salò (population a mere 10,000) I saw it twice... it's trying to take over. Do what you can to stop it.